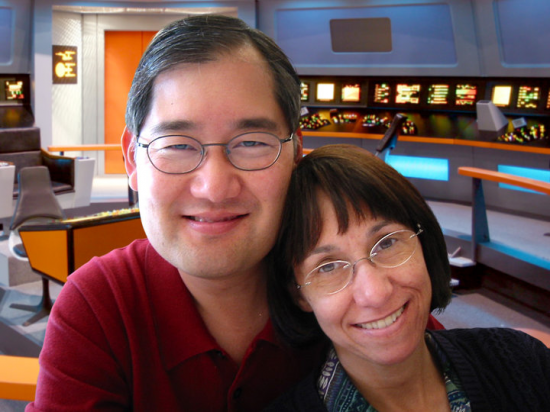 Michael and Denise Okuda on the set of the “Star Trek: Enterprise” two-part episode “In a Mirror Darkly” in 2005. Their combined “Star Trek” careers include four TV series, seven movies, and the remastering of the original series. Graphic designer Michael Okuda and Denise Okuda, a graphic artist, both long-time members of the Art Directors Guild (IATSE Local 800), are set to receive the prestigious Eagle-Con Prism Award to be presented by California State University Los Angeles on Thursday. Michael Okuda has been credited on more “Star Trek” movies and television episodes than anyone except series creator Gene Roddenberry. Eagle-Con is Cal State L.A.’s mini indie comic book convention, celebrating the creative arts and exploring diversity in identity representation. The Prism Award is given in recognition of the envisioning and projection of a diverse and representative spectrum of people into the future through artistic media. The award will be presented in the university’s Student Union at 5:30 p.m. He was technical consultant on many of the “Star Trek” television shows and movies and “invented” the so-called Heisenberg compensator as a way to explain how the fictional transporter might work. In the real world, Okuda has designed logos for NASA missions and has received the NASA Exceptional Public Service Medal. The Art Directors Guild will be providing some 200 pieces of art for display at Eagle-Con.